I wanted to let my constituents know about the upcoming Reapportionment Committee Hearing on Thursday, June 30, from 5 to 7 p.m. at the LeCraw Auditorium, Georgia Tech College of Management, Suite 100, 800 W. Peachtree St. NW, Atlanta, GA 30308. I also wanted to provide an explanation of the reapportionment and redistricting process, and encourage you to become involved. Every ten years, following the census, the boundaries of all legislative districts are redrawn to reflect changes in population distribution. 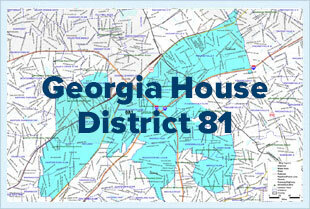 Redistricting applies to all governmental districts: U. S. Congress, GA House and Senate, DeKalb School Board, and DeKalb County Commission districts. This process is underway right now, and you can play an important role. Essentially, you can have a voice in how you will be governed for the next 10 years. WHY ARE DISTRICT LINES REDRAWN AND WHY IS REDISTRICTING IMPORTANT? The U.S. Constitution requires it. It's also the fair and equitable thing to do, in order to provide representation that is as equal as possible as population increases, decreases or shifts. In most states, including Georgia, the state legislature is responsible for drawing district lines. However, in some states, also including Georgia, historic problems with drawing maps that fairly represented the population have placed the legislature under a judicial watch, and often the courts have had to intervene. Redistricting occurs during a special session of the General Assembly. This likely will begin on August 15th, and will last two weeks or more. WHAT PRINCIPLES MUST GUIDE REDISTRICTING? • A redistricting plan must create districts that are approximately equal in population. • A redistricting plan must not dilute the strength of minority voters. • A redistricting plan must not be a "racial gerrymander." • A redistricting plan must take into account traditional redistricting criteria such as compactness, contiguity, and respect for political subdivision lines and communities of interest. It is important that community boundaries be respected. In some areas, those boundaries can be quite clear—towns, small cities, counties, and so on. In metropolitan areas, there may be meaningful units that function as communities which, when intact, benefit from common representation at the school board, county, and state levels. 1. Attend the local public hearing—details at the top. 2. When you attend a hearing, sign up to speak so that your concerns are made part of the public record. 3. Plan to attend organizational and community briefings on reapportionment. These are sponsored by the League of Women Voters, some religious communities, and organizations that work with various community groups. For a detailed rundown of redistricting and how the courts will most likely play a role, check out this June 27th AJC article.